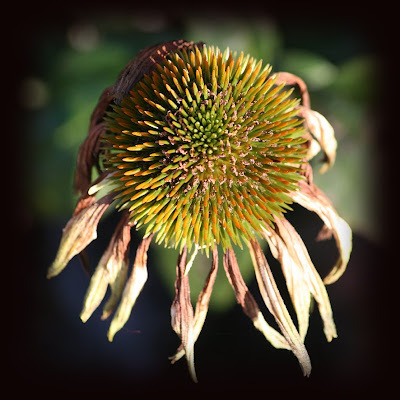 The coneflower above is a new arrival to my garden (last year) but unfortunately I have mislaid the label for the moment. I’ve enjoyed this one at my front door. The verbena and catmint (nepata) have been in my front garden for a few years now. 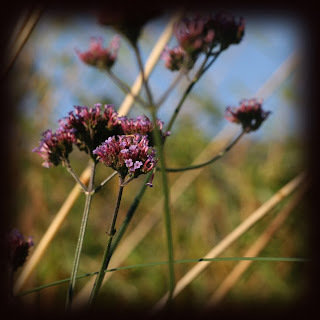 This verbena doesn’t self seed in my garden as it does further south in the UK and other parts of the world were it seeds profusely. This catmint I just wouldn’t be without. 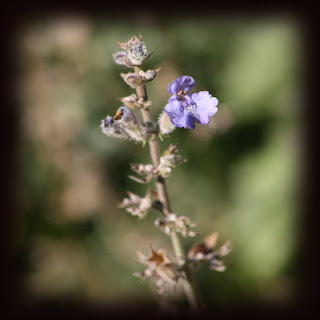 It gives a wonderful skirt of purple/blue flowers which the bees absolutely adore. Pruning it paritally back just as the flowers look like they are going over and then pruning the remaining stems after they have completely finished has given me a second flush of flowers every year without looking at the plant completely cut to the ground and waiting for it to grow back. There are always flowers for the bees this way too although none are visiting the last solitary blooms remaining today. Perhaps you’re tired of me mentioning how this year I have loved the perennial wallflower (ERYSIMUM) above... but perhaps other GBBD bloggers haven’t heard of it. It has a long flowering season and that’s exactly what attracted me to it. The bees and butterflies have loved this one too and it makes me smile every time I come in my drive. 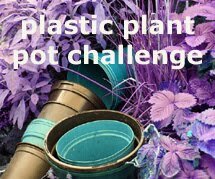 I have yet to see if it will be hardy in my garden and I plan to take some measures to protect two of the three plants I have. 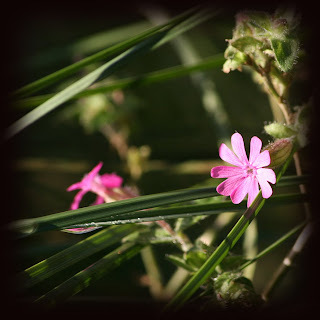 The red campion above grows in my front and back garden but it is more common in woodland and hedgerows. I grew this one from seed and love it in my front garden where it is growing behind the ornamental grass stipa gigantea. Completely in contrast to the habit of the tall floppy red campion stems is the tiny compact mound forming Erodium in pots at my front door. This was a new addition for this year too after seeing it on a garden centre sales table with bees going to its small cup flowers. Just how did they find them? Ah... the fine violet blue stripes lead them there! 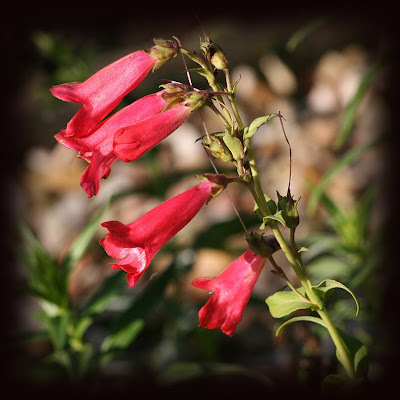 One of the most common flowers that you see bees visit are the ones with tubular flowers like the penstemon above. Now this plant is another I wouldn’t be without. I’ve had these wonderful coral red flowers in my front and back garden for a few years now. They prefer my sunnier front garden and I have multiplied my stock of this plant very successfully from cuttings. I do love taking cuttings especially at this time of year and this is the time I find I use my small (6ft x4ft) greenhouse the most with them and over wintering a few plants too. I think I’m too late for trying cuttings of the little KNAUTIA above. 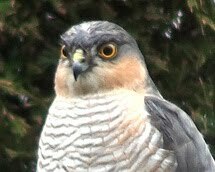 This is another new addition to my front garden for 2009. Unfortunately the foliage of this plant appeared to suffer from mildew after flowering. I considered pulling it out but am very glad it didn’t! The foliage looks fine again and its also giving a second flush of flowers too as if to say don’t give up on my quite yet! I wonder how hardy it is though. The bees and butterflies have loved its pincushion flowers. 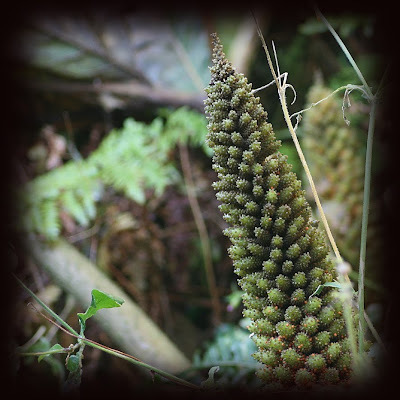 Next, to a more unusual bloom… the cone flower of the gunnera shown above. Now, this plant needs protecting very soon in my garden. If the garden stays dry for a couple of hours today I’ll be out to do it. It's looking good at the moment. I’ve mentioned in previous postings about how to protect a gunnera for winter. 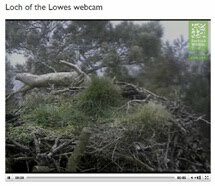 You can read about what I do and see photos here. 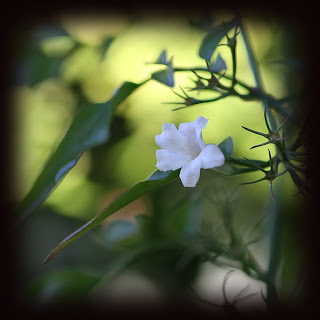 A few hardy white jasmine flowers can be just spotted trailing over my walkway pergola. 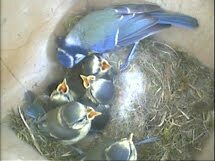 The sunshine just before lunchtime last Monday just helped me see them. But what’s going on in the fern photo taken at the same time? Nope… I wasn’t out watering it and nope it hadn’t rained either! Can you remember the weather last Monday, the 9th of November? We had our first real frost! 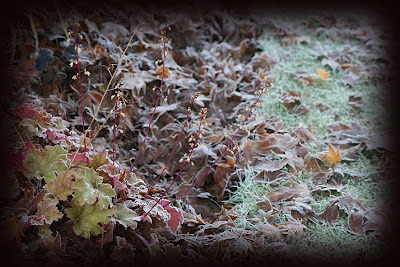 My garden was completely coated in frosty crystals and at 6.15am the car temp read -4 deg C! I didn’t manage to get out with my camera until 11.30am and by then some part of the garden never even looked like Jack Frost had been near them. It just shows what a warm little sunshine can see Jack Frost away! 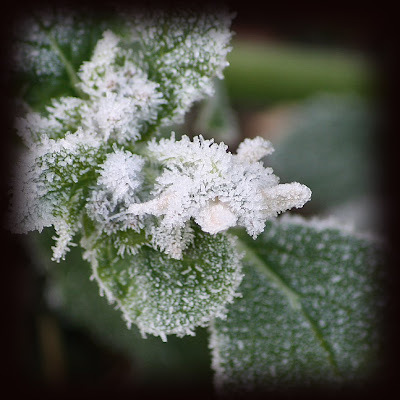 Do you recognise the frosted flower in the larger photo above? I took many frosted photos that frosty lunchtime and it was very difficult choosing just a few. 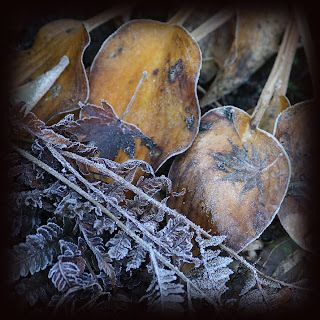 My favs were the flower above, the almost fossilised leaves on the fading hosta leaves and other Acer leaves making a crisp carpet in borders and sprinkled across the frosted lawn. Heuchera leaves also caught my eye as you can see in the final photo above. Can you also see that this plant is also holding on to some flowering stems. I was surprised to see these tiny wonderfully delicate flowers. Looking out on to my garden today and I can see I forgot to photograph some remaining Japanese anemone flowers. I can also see fluffy flowering grass heads and buds on my magnolia. I have plans to move that magnolia to my new pond area at some point but I’m not sure when I should do this. All photos above were taken in my garden on November 9th 2009. This was the first frost of this season. Congratulations for being unfashionably on time for this Bloom Day, Shirl. 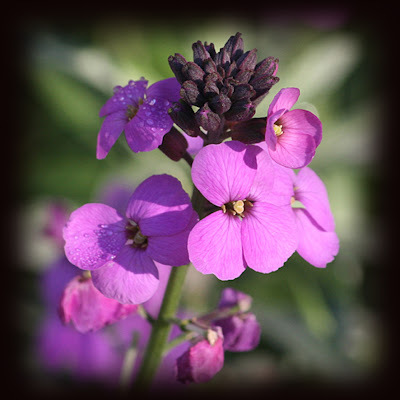 You still have so many gems in your garden, but I especially envy you the erysimum; I'd dearly love to grow them ('Wenlock Beauty' is one is particularly covet), but they hate my garden. It's nice to see yours thriving. Your frosty photos are a treat, too. Happy Bloom Day! Beautiful photos Shirl! I love Gunnera but haven't tried it yet. Soon. It's amazing to watch Gunnera make those huge leaves all over again every year. Lovely photos and still so much around for you. I had forgotten it was GBBD... I've been busy 'receiving' guests *shhh, it's my birthday* so didn't get any real chance to get outside. Lovely post. 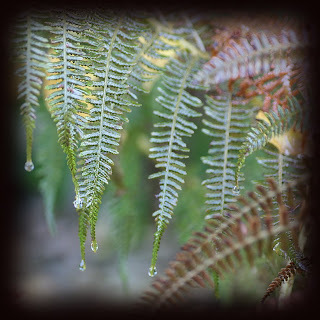 Really like the shot of the fern with the water droplets on it, just wonderful. Lovely penstemon. 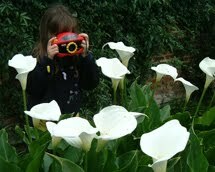 Like you, it's a plant I wouldn't be without - although mine are white and pink. I enjoyed your blooms. I grow some of them, too. I have both Mars Midget and the larger knautias. I had bought one of them, and got a start of the other from someone, not realizing they were different. I grow different kinds of penstemons, too, but none are blooming right now. Yours is a nice looking one. I've got many of the same flowers here, although not all are still blooming. I grew Variegated Wallflower this year and it has not stopped blooming since early spring. I love Wallflowers. There's something wonderful about that first that I can't quite put into words. And I envy you the catmint. I had a Nepeta 'Walker's Low' blooming away last spring, but it died over the summer. I guess it needed more water than I gave it. Lovely photos. 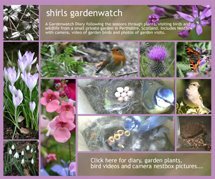 A quick scan of my garden shows fuchias, dahlias, the first of the winter jasmine, the last of the Echinops and lavendar, and even a few pelargoniums still hanging on - but then, we haven't had a frost down here yet. I bought that Erysisum for a customer this year and was so impressed with its performance that I have taken lots of cuttings - it is quite lovely. Gems are a great way to describe the flowers at this time of year. Yes, that perennial wallflower has been a revelation to me… a real treasure! I have no tolerance at all for the spring bedding wallflower but the promise of the perennial flowering all the way from April had to be worth considering. I loved this variety for the foliage colour especially. The flowers? Well they did what they said on the label! I did have one little trick there though…. I cut a small shallow dip into this bed making a narrow gravel path for my (young at the time) daughters to walk underneath the gunnera’s leaves. Any rain water runs down towards it. 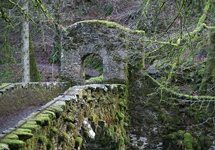 There is also a basic little bridge made of three poles across the dip. 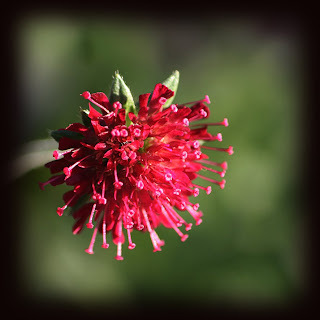 I really like the Knautia, too bad it has mildew problems. I hope I'll be as happy with my Erysium 'Bowle's Mauve' as you've been with yours. 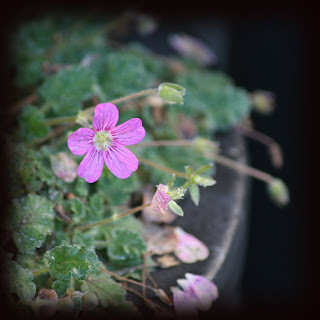 I bought it to put in a container for the summer, then learned it is not an annual, but a hardy short-lived perennial. I planted it in the ground immediately. It's great to be able to visit your garden again. I've been a bit busy lately, but I want to go back to do the things I love. You still have a lovely selection of flowering plants there Shirl. Happy GBBD Shirl. I like to look at your blooms no matter when you post them. How lovely to see colour in this drab weather Shirl, although I can see yours has been frosty rather than dull...minus 4! brrr! I always admire Gunnera when visiting open gardens but have never tried it in mine. Heuchera is always valuable I think, not spectacular maybe but very reliable. One of mine came originally from my late in-laws garden and never disappoints. I have Coneflowers in a pot and was sure they had not survived after the Winter so I was delighted when they suddenly reappeared much later than I had expected.